“I don’t know in this moment,” Sarri told a press conference after Chelsea’s 5-4 win on penalties at Stamford Bridge when asked of Courtois’ future. Chelsea are reported to have sealed a world record £71million deal for Athletic Bilbao goalkeeper Kepa Arrizabalaga, but Sarri refused to be drawn on any details of the potential signing. “If I don’t know anything about Courtois, I don’t know anything about Kepa, of course!” the Italian said. Hazard, whose future has been in doubt all summer, was given a rapturous reception by Blues fans during their side’s penalty shootout win against Lyon and Sarri said he had “no problem” with the midfielder. Courtois was handed an extended holiday after finishing third at the World Cup with Belgium and was expected to return to the Blues’ Cobham training base on Monday, but did not attend. 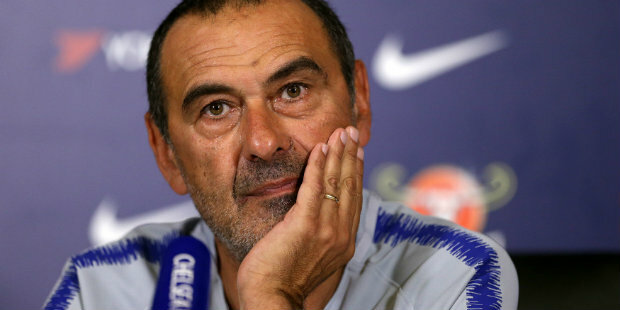 Reports suggested he was also absent on Tuesday, having told Sarri he wanted to leave the club before Thursday’s transfer deadline. Should Courtois – signed from Genk in July 2011 before spending a three-season loan spell with Atletico Madrid – not resume training with the Blues, he is likely to face an internal disciplinary meeting and the potential of a fine of up to two weeks wages. The likes of Kepa, Jan Oblak of Atletico Madrid and Stoke’s Jack Butland are potential replacements should Courtois depart, but all parties are up against the transfer deadline to get any potential deals completed. Chelsea, meanwhile, could also be set to make another addition to the squad with a loan deal for midfielder Mateo Kovacic from Real Madrid, according to reports in Spain. Be the first to comment on "Sarri refuses to discuss Courtois’ future but gives positive update on Hazard"